Douglas Elton Fairbanks Jr., KBE, DSC, (December 9, 1909 – May 7, 2000) was an American actor and a decorated naval officer of World War II. 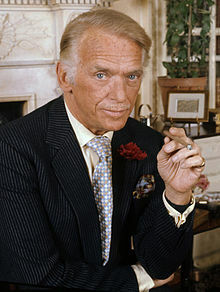 Douglas Fairbanks Jr. was born in New York City, the only child of actor Douglas Fairbanks and his first wife, Anna Beth Sully. His parents divorced when he was nine years old, and both remarried. He lived with his mother in New York, California, Paris and London. Fairbanks's father was one of cinema's first icons, noted for such swashbuckling adventure films as The Mark of Zorro, Robin Hood and The Thief of Bagdad. Largely on the basis of his father's name, Fairbanks Jr. was given a contract with Paramount Pictures at age 14, appearing in Stephen Steps Out. He initially played mainly supporting roles in a range of films featuring many of the leading female players of the day: Belle Bennett in Stella Dallas (1925), Esther Ralston in An American Venus (1926) and Pauline Starke in Women Love Diamonds (1927). In the last years of the silent period, he was elevated to star billing opposite Loretta Young in several pre-Code films. He appeared in Our Modern Maidens (1929), which led to a well-publicized romance and marriage to his co-star, Joan Crawford. He also appeared with John Gilbert and Greta Garbo in A Woman of Affairs (1928), which gave his career a considerable boost.